I got an email this morning from a company I bought some sewing patterns from a while back. Decades of Style pattern company have put photos of many of their patterns made up on their site, and the results are gorgeous. Not all of the patterns are there, but a good number of them, beautifully made, and with such authentic looking fabrics. I bought some of their patterns months ago, mostly because I saw a blouse reviewed in Threads magazine, and when I visited the site the postage was the same price for up to 5 patterns. I’m ashamed to say I haven’t made them up yet, but seeing these photos has made me determined to bump them up the ‘to do’ list a little! That’s after I’ve finished a quilt for my Dad’s 85th birthday (in 2 weeks) and a dress for a Christmas function for my daughter, also in 2 weeks. Both are fortunately fairly simple projects. Two of the patterns I bought from Decades of Style were blouses, the 1940s Girl Friday blouse, and the 1950s Collar Confection blouse. Both would be good to have made for the summer, I will make myself an appointment to go through the stash and see what fabric I have to use. Whilst the examples on the website are made of vintage inspired fabrics, I think they would translate quite well into contemporary fabrics if well chosen. Lightweight linen in a plain colour or small print would do fine, or a softer rayon type print. I am pretty sure I have something suitable somewhere. Another project I’ve been giving some thought to lately is the re-organisation of my sewing space. Actually I don’t think the word re-organisation is valid, since that implies an existing level of organisation, which I can’t honestly say there is. I have a space, not huge but I think adequate, but it needs cleaning, tidying, and lots more storage. Not only that, but it needs to be organised so that I can find what I need, and don’t end up going out to buy more of something just because I can’t find what I already have. I can’t wait to go through all the boxes which are hiding in the garage and sort them out and create some kind of reference for what is in them. Most of the stash will have to stay in the garage since there isn’t room for it in the house, but it would be really good to know what was out there and where it was. A database of some sort is required I think, although I have thought of just taking photos of the content of each box and having them on my computer for browsing when I want something. I’m also working on how to set up a cutting out surface. The space I have doesn’t really lend itself to a permanent cutting out space, which really needs to be at least 1.5 metres square, and preferably more, with room to walk around all four sides. I’m trying to come up with a project for fold-away cutting out space, but not too hard to put away so that I don’t bother to do it. My current thought is a couple of small chests of drawers, on castors so they can be moved, and with flaps hanging down each side which can be raised. Two chests together, and the flaps, I think can be made to give me a surface about 1.2 metres by 1.8 metres, and still be manoeuvrable in the room, which is only about 2.4 metres wide, although quite long. Something similar to this, but I’ll probably try to make it myself, or at least put a top onto a purchased chest of drawers. That’s after the kitchen, and the tool cabinet in the garage which isn’t finished yet! And a few other things! 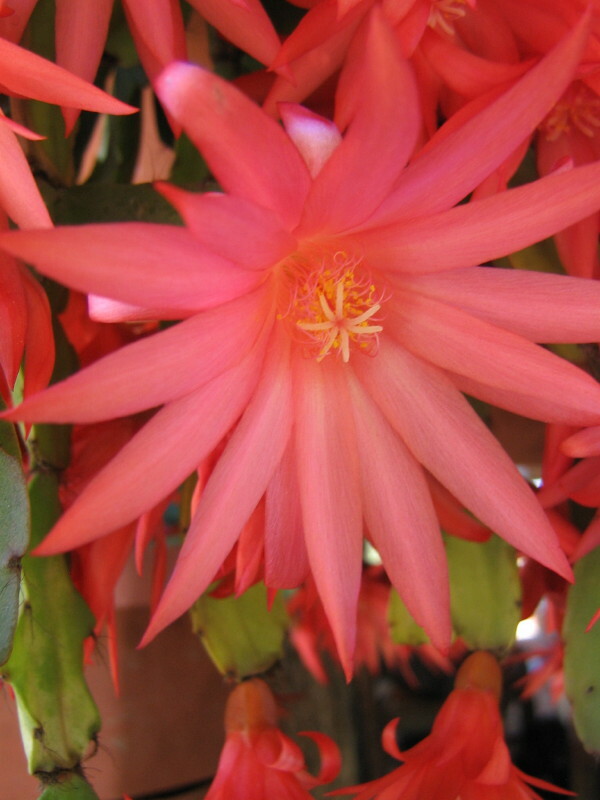 This week’s photos are what in England we used to call an Easter cactus, because it flowered about Easter. 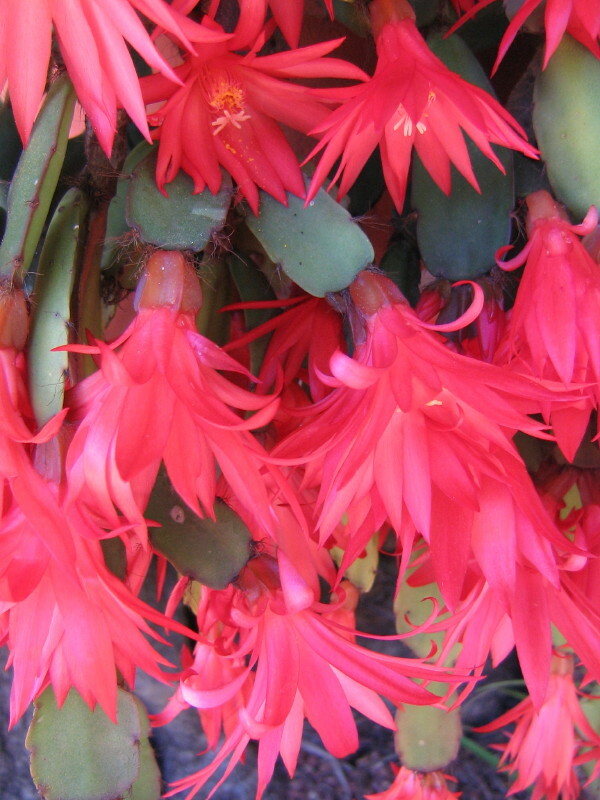 Here in Australia it flowers in spring, but that’s nowhere near Easter. I’ve Googled it, and I think it is properly called Hatiora gaertneri, the name being nowhere near as pretty as the flower, as usual. It is really spectacular this year, although I should have moved it into the sunshine before taking the pictures, it would have looked even better. I was intrigued to find this website, and astounded. Who knew there could be so many ways of starting to write, or get ideas for it? Does this mean that the infamous writers’ block is so widespread that all these starters are necessary, presumably so. I particularly like the Story Starter idea, and the Plot Generator. I’ve been reading elsewhere about the use of software to create articles, which I don’t like the idea of, but using software to spark an idea is not quite so bad. I have to admit that as a newbie to blogging I’m finding it difficult to think of things to write about. I guess part of the difficulty is that I’m trying to write this blog as practice, and also to show my writing when I can get started, so I’ve limited myself as to topics. I think perhaps the practice part needs to have more prominence, I should just write and not worry about who might read it. It’s a similar quandary to one I read about recently, that of making small talk. Making small talk is definitely a skill, and one which needs to be learnt and practiced. I think I used to be quite good at it, I can remember going to functions, and having to sit between two strangers at dinner and make conversation with them. I used to be able to do it, but I’ve gotten out of practice, although I think I’m getting better at it again. I also think I am more confident to say things, and less worried about what people might think. The book I read about making small talk suggested ways of thinking of topics, using your surroundings as a starter. For instance, the view from a window, or a picture in the room might suggest a subject for conversation. One point strongly emphasised was the difference between open and closed questions, and that closed questions don’t encourage the flow of conversation. I find this difficult though, since the open questions suggested sound a bit stilted to me. The writer was very strong on such things as ‘What experiences have you had?’, ‘What places have you visited?’ and similar things, which I also feel are a bit intrusive. On the other hand, we are often told that people like to talk about themselves most of all, so perhaps this is the right approach. I kow that I am sometimes out of synch with other people on this, I’m not sure if it’s my English upbringing which makes me more reserved than the Australians I mix with these days, or whether I’m a bit old fashioned. I think it may be the former, since Australians of my age group are more frank about things than I tend to be. I’ve always noticed it ever since I came to live here, subjects which I would not bring up seem to be acceptable topics of conversation. I don’t really know where this post is going, perhaps because it’s really going nowhere. I need to practice two things, first thinking of topics for conversation, preferably before I need them, and second thinking of topics for blog posts. In the meantime I might add a picture, one of those being worth a thousand words! 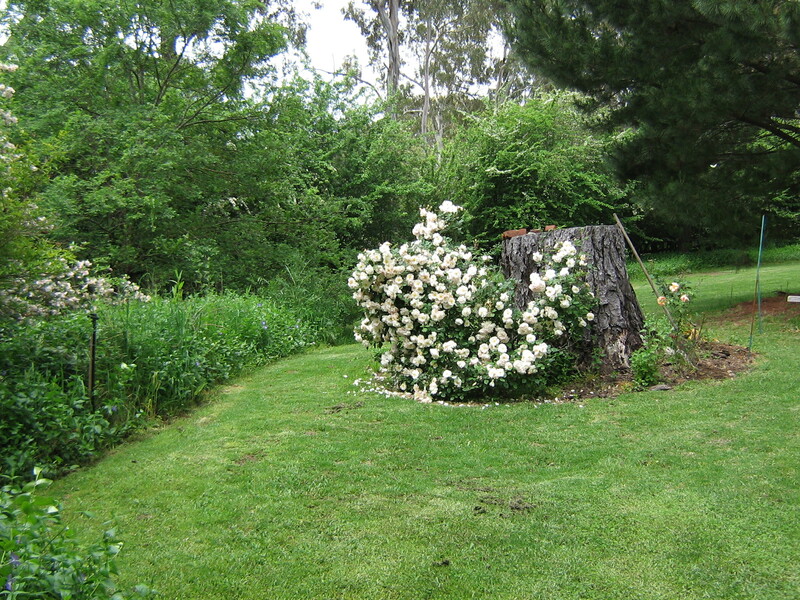 This is a photo I took in the garden of The Cedars, just outside Hahndorf in South Australia. The property is where the artist Hans Heysen lived and worked, and still belongs to the family. A beautiful setting, much more English than I remembered. Subject for another post perhaps. Note to self. A good idea would be to select a topic, a place, person, book etc., do some research, and write the blog post as a mini article on the subject. Hone my skills at research and writing at the same time, and demonstrate what I can achieve in both areas. Here are the skirts if you’d like to look. For example, see if you can figure out what this person is trying to say ‘it’s necessary that we peek following ourself.’. Do you think they mean we should look after ourselves? As if to demonstrate the need for original content, it wasn’t long before I came up with the same article on more than one page. To make it worse, the sites weren’t even about making skirts, which was what I was looking for. They were for all sorts of other things, in some cases I don’t know what they were about. One was multi-level marketing, some were just inexplicable. If you try searching just blogs, I think you get even better examples of computer generated content, as opposed to quality original writing. I’m not going to post any links here, for fear of offending someone, but try it for yourself. It reminds me of Roald Dahl’s story, The Great Automatic Grammatizator’, but I’d have to dig out the book and read it again to remember exactly how it goes. It was I think based on a guy who invented a machine for writing novels and such. The theory being that there are only limited numbers of combinations of words, and that literature could be written according to a mathematical formula. I’ve heard the same idea applied to music. How did I get from deciding I need new skirts for work, to deciding to read a Roald Dahl story again? Go figure! And have fun looking for similar examples of writing. OK, so I’m new at blogging! Now I feel like an idiot! It seems the plug ins I was looking at (not sure of the spelling, should it be plugin or plug in?) are available if you have downloaded the WordPress software and are using that. Since my blog is still hosted by WordPress I can’t use them, or at least I can’t see how. If anybody can tell me different then I’d be happy to hear them. Still, disappointed as I am, I need to remember the reason I am writing this blog. It’s part of working towards my goal of being a good freelance writer of magazine articles, so the content is the thing, not the gadgets. Also, I figure that maybe search engine optimisation is something best done by a human, not necessarily by a machine. Some of the internet content you read consists only of words and short phrases which don’t really make sense, and now I’m wondering if they have been written by a machine. Those are the kind of articles which nobody actually reads, although I have this vision of people who maybe are not fluent in English looking at them in complete bewilderment! What I think I am going to look around for is a good note taking piece of software. I did use Webnotes for a while, but then when Firefox got upgraded it was no longer compatible, and so far I haven’t found a substitute. I want something I can just open and type a few words into when I’m inspired by an idea for a blog post. If the inspiration is a web page then I can use Scribefire, but if the idea just comes to me out of the blue I need somewhere to put it, and to be able to find it again. The electronic equivalent of a notebook and pencil. Who knows, maybe I should just use one of those anyway, I need one for when I’m not at my computer (haven’t yet got a tablet or a smart phone, and even if I did I wouldn’t necessarily always have it to hand). I’m sure there must be something around, watch this space! Doing more browsing on Tris Hussey’s site, found this post about plug ins for WordPress. I have to admit that apart from Akismet, which I think you get by default, I don’t know what any of them do, and most of them I can’t even begin to guess. A few I suppose are reasonably obvious, and I can’t imagine myself needing some of them, not just yet anyway. Time to spend some time investigating I think. One which I find intriguing is All in One SEO pack. The idea of software changing my post so that search engines will find it is a little spooky, perhaps I’m being old fashioned. I might give it a try, so long as I can over ride it when I want, since I want the words on my blog to be mine, and not somebody else’s. Still, I’m also keen on the idea of the blog being seen, so that’s a consideration. I’ll check it out and report back!